Monta is a young boy going through the Isshu Region. Though he is inexperienced and doesn't quite understand the finer points of battling, he is eager to learn and isn't willing to give up. He cares deeply about his pokemon and will do whatever it takes to support them. He is friends with Cheren and Bel. He is based on the male protagonist of Black & White. Monta first appears in Volume One, Chapter One. 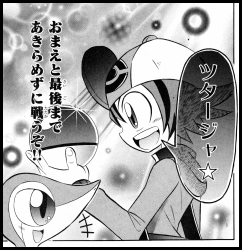 Cheren is Monta's and Bel's friend. He seems to be a bit more knowledgeable than Monta when it comes to being a Pokemon Trainer and never hesitates to let him know that. He is the one who suggests that he and Bel travel with Monta. He also comes up with the strategy that is used to defeat the Bousouzoku King. 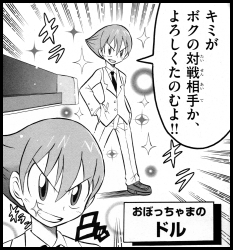 Cheren later helps coach Monta in his first triple battle. Bel is Monta's and Cheren's friend. She chose Mijumaru as her starter. Cheren and Bel first appear in Volume One, Chapter One. 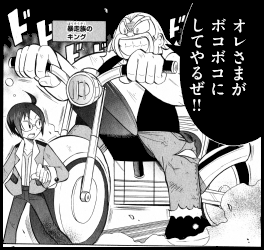 The Bousouzoku ("bike gang") King is an older trainer who approaches Monta and the others to pick a fight. He thinks his opponents are weaklings and will earn him an easy victory, so he invites Monta and Cheren to battle him two against one. Despite his pokemon's overwhelming power, he is eventually defeated when Monta and Cheren team up and pull off a Combination Technique. He is based on the Bousouzoku ("Biker" in the English versions of the games) trainer class. The Bousouzoku King first appears in Volume One, Chapter One. 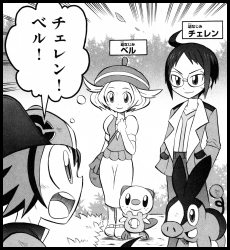 The Pokemon Ranger is a trainer Monta meets after capturing his Emonga and Doryuuzu. He has a double battle with Monta and uses his Zebraika's "Lightning Rod" Ability to surprise Monta. He is eventually beaten when Monta combines Sandstorm with his Doryuuzu's "Sand Power" Abililty to deliver a one-hit KO to the Ranger's pokemon. He is based on the Pokemon Ranger trainer class. 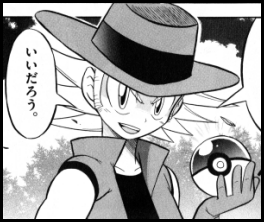 The Pokemon Ranger first appears in Volume One, Chapter Three. Dol is a young man Monta meets on the Battle Subway. The flashy boy defeats Monta with Buffaron's Herbivore Ability and by having Kokoromori fly out of Gantle's range. A few days later, Dol is challenged to a rematch. He tries the same tactics he used before, but Monta is able to win by teaching his pokemon new techniques and using a prize he got on the subway. He is based on the obotchama ("Rich Boy" in the English versions of the games) trainer class. Dol first appears in Volume One, Chapter Four.